From 100 business class seats, the new configuration is 67 business class and 94 premium economy seats. But at the same time, this is less than the usual configuration the airline has on its other A350 aircraft. 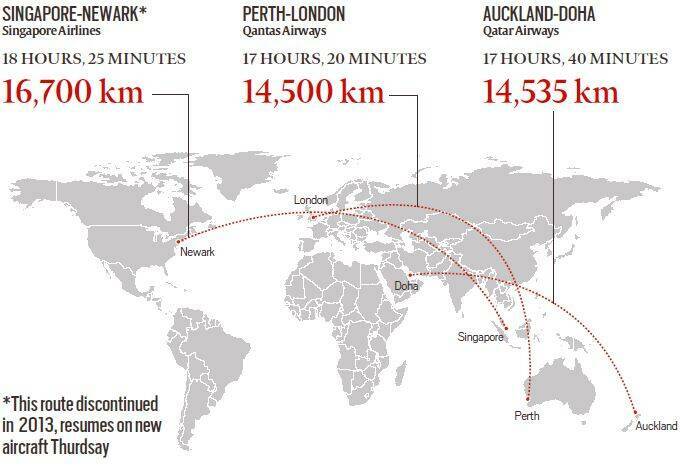 Since 2003, the longest flight was Qatar Airways’ Auckland-Doha on a Boeing 777-200LR (long range) at 17 hours, 40 minutes and 14,535 km, which the Singapore Airlines flight will now upstage with the world’s first Airbus A350-900 ULR aircraft . On Thursday, Singapore Airlines will fly its new Airbus A350-900 ULR (ultra-long range) from Changi Airport to Newark Liberty Airport, the commercial flight with the longest duration (18 hours, 25 minutes). The airline did fly that 16,700-km route earlier, but cancelled it for inefficiency in 2013. In reviving the flight, the airline took a number of measures to make it operationally efficient and comfortable. There are also various passenger comforts, and provisions to carry 24,000 litres more fuel than the standard A350-900 aircraft. The additional weight due to the higher fuel carriage will be offset by carrying fewer passengers than other aircraft. The fuselage is made of light composite materials; the aircraft is expected to consume 25% less fuel.